The market has a number of luxurious cars. The car which you own has fewer comforts than the car in the market. So you can sell the used cars which may give you some part of money to buy the new one. But selling a used car is a tedious process if the condition of the car is not good. This article will give you a number of tips to increase the value of your used car. Tip 1: Prepare your car, how to do this? Before you provide the car to the market, you must check whether the condition of the car is nice. Is it capable of working properly? The next thing to notice is about its appearance. Your car must impress the buyer on the first sight. Tidy look of the car doesn’t attract the buyer. So clean the car and wax it to give a glow look. At the same time you must clean the interiors of the car. You must have all the papers of the car in proper way. The car’s service record plays an important role while pricing it. Tip 2: Decide the price for your car. For this you go to the following website Kelly blue book. This website provides you a clear idea to fix price for your car. Tip 3: Advertisement is the most needed thing. Provide attractive advertisement about your car on the local channels. Fix bulletin boards in front of super markets and outside colleges. Try to advertise in some of the websites. Be cautious that you spend affordable money for advertising. Tip 4: Try to find a nice broker who will sell your car for good rate. You hire a broker who will sell the car for good price. Used car brokers always need the car in proper condition. He will take care of all the advertisements and other needs. Only thing you should provide him a commission of 5% to 10% of the price of the car. Most brokers will get money from the buyer and the seller. Tip 5: Now a days we have lot of used car dealers just sell the cars to them. They will take care of all the other works. But you can’t expect very good price for your car. But it is the quickest way to dispose your car. If all the works are completed, you got the buyer means, don’t forget to transfer all the papers to his name. at the same time you must inform the DMV(dept. 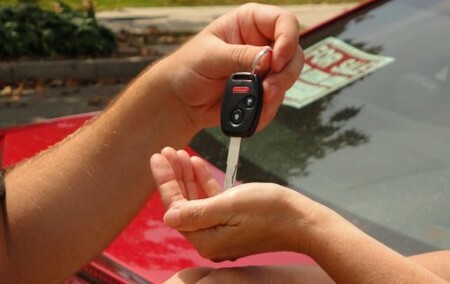 of motor vehicles) about the car you have sold. Then DMV will relieve you from all the responsibilities.